I thought I’d be more tired than I was this morning after yesterday’s bigger mileage and getting to sleep so late, but I woke really refreshed. 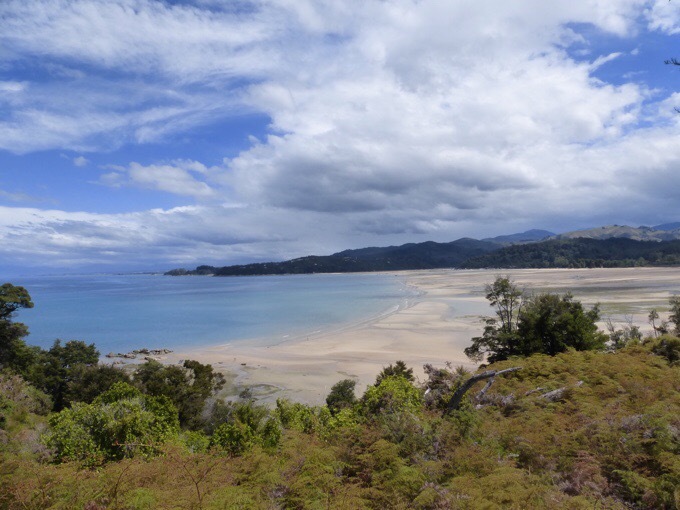 I needed to hitch a couple hours to the town of Marahau to start my bonus side trip to the Abel Tasman track. 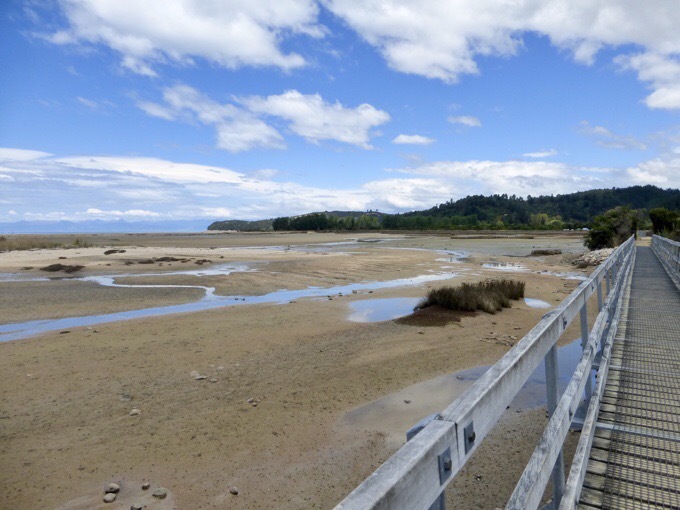 The Abel Tasman is a 37mi/60km coastal track that is one of New Zealand’s 9 Great Walks, which means it’s hard to get in on. A lot of things had to fall into place for this one to work out. First, there needed to be open campsites (or huts). 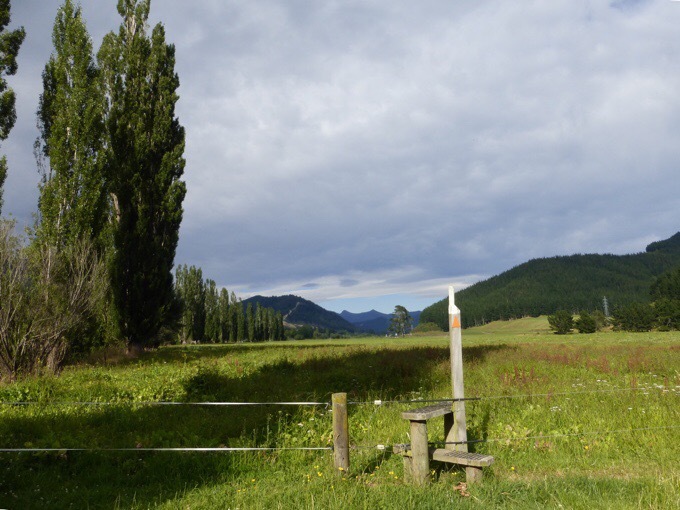 When we crossed over to the South Island, I checked out my options at the iSite. The iSites in New Zealand are awesome by the way. So informative, efficient, and overall friendly! It turned out that there were campsites open on both ends, but none in the middle. That worked in my favor because I can fortunately hike the bulk of the trail in one day if needed. Not ideal, but doable. The next part was the tides. 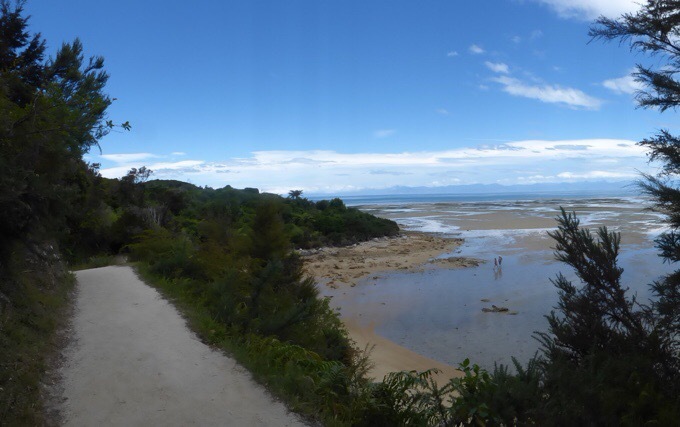 There are two tidal sections on the Abel Tasman. One is tomorrow morning, and I can walk an inland track I hear is just as great. The other one is the latter part of my day, and as luck would have it, low tide is at 4:30pm, perfect! Lastly, I needed weather to participate and it is! There may be light rain showers tomorrow afternoon, but it looks great! There was also a water taxi I needed to book to get back from the end. That has plenty of open spots, so I am all set with many time options on the return. All that was done in a 20min visit to the iSite between the brief layover of the ferry and water taxi when we came over from the North to the South Island the other day. I was on the street with my sign to hitch to Nelson just after 8am this morning. As I started hitching, it hit me that my hitch will drive right past the farm track section of the TA I would have liked to do last night. 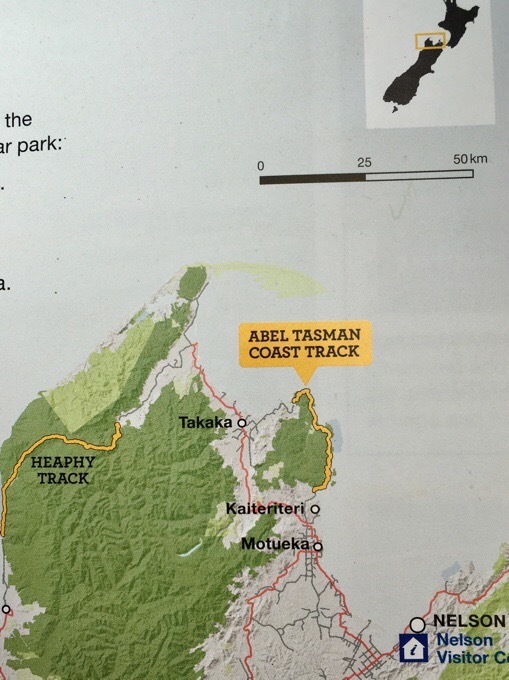 I got picked up in minutes by a woman from Hawaii on vacation (I forgot to snap a photo), and impulsively had her drop me off where I left the TA yesterday so I could knock out the 4mi/7km of farm track since I had all day to get to the Abel Tasman. I was so glad I did that bit this morning. The farm tracks are just tiring because there isn’t a path, and it is walking in varying depths of grass. Fortunately, it was scenic and most of it wasn’t full of divots from cattle. There were lots of stiles to go over. One of the farms appeared to be a vegetable that was maybe potatoes. I felt silly that I wasn’t sure. Thankfully, it hasn’t rained in awhile, so the grass was dry. The last half hour or so, I could totally see it being a soggy mess as it went through a cow farm with lots of consolidated mud, small streams, and cow diarrhea. I did wonder why the owners of this property prefer us walking through their farms to the lovely dirt/gravel road along the farm that was on the other side of an electric fence. It is like a beautiful wide trail and not a single car drove on it while I was going through. I’m interested in the reasoning on that one. 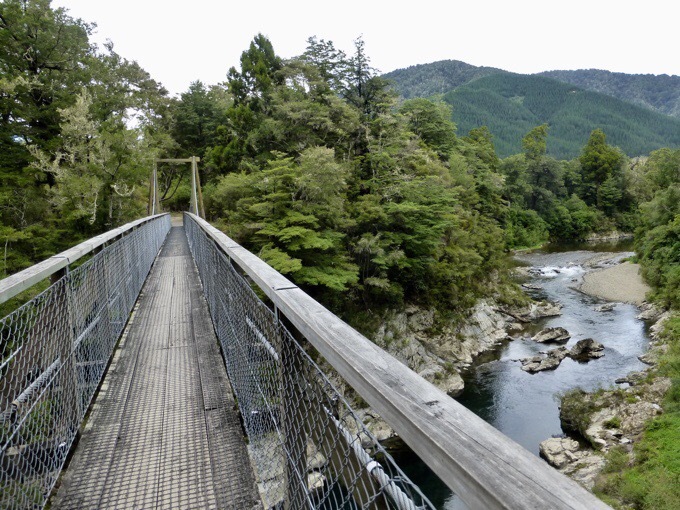 The track finished with a great track through a forest reserve that had a nice suspension bridge (Pelorus Bridge) and ended at the same highway I took out of Havelock. Time to hitch again. I was there for less than 10mins when a couple from California picked me up. I had a sign to go to Nelson figuring it was the biggest town along the way and most are going through there. Grace and Gary (photo to come later) are here on vacation for three weeks and we’re headed to the Nelson iSite to look into ideas for area. 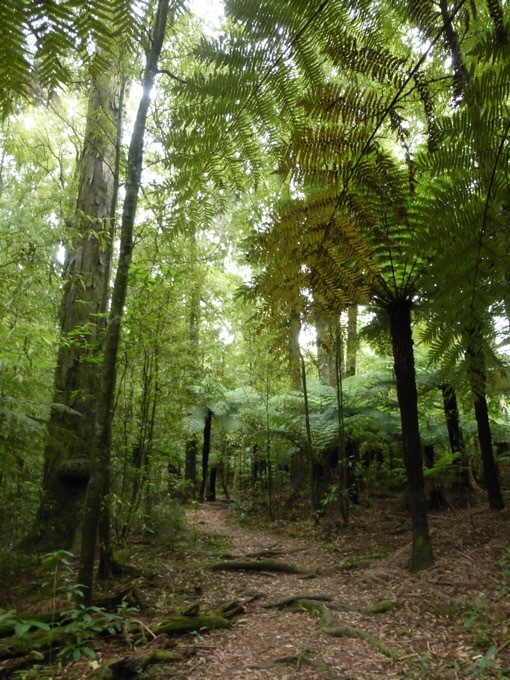 I too wanted to go there to inquire about the Heaphy Track, another one of the Great Walks near the Abel Tasman, so we went together. 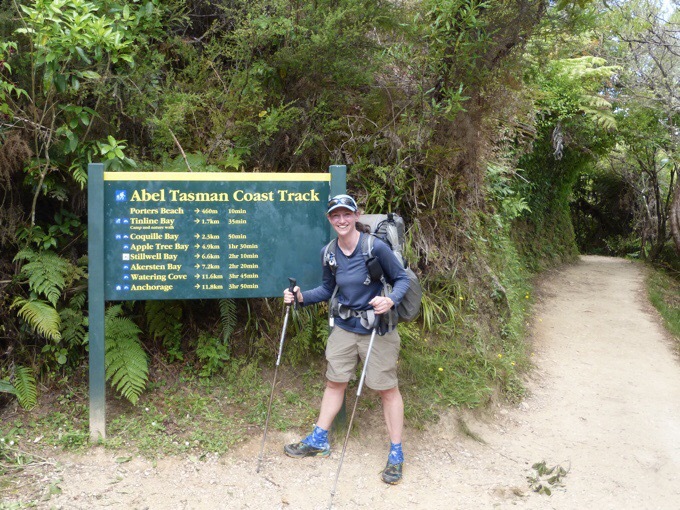 In the end, I decided not to do the Heaphy Track. The logistics were a pain (it ends in the middle of nowhere requiring a flight or multiple days on buses), it was going to be pricey, and weather wasn’t looking good as it rains a lot on that coast. I went back and forth on it all day, but am now happy with my decision not to do it this time around. 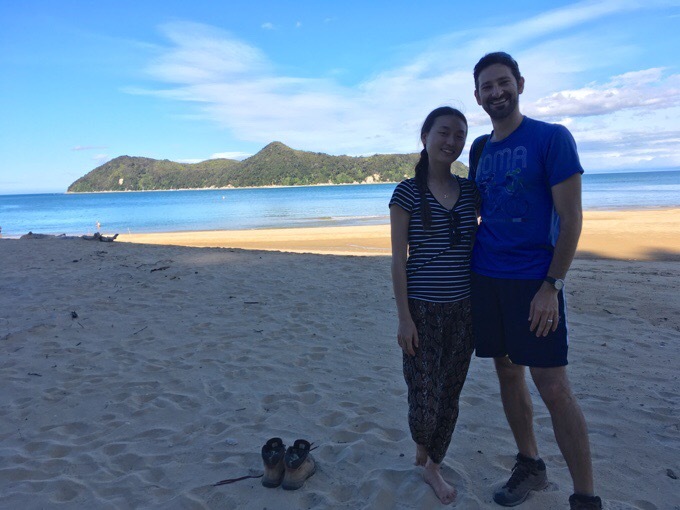 Grace and Greg decided to also head up to Abel Tasman National Park, but needed to eat lunch and get groceries. I decided to hitch and they said they’d pick me up on their way out if I hadn’t been picked up. Well, again, within 10mins I got a ride! 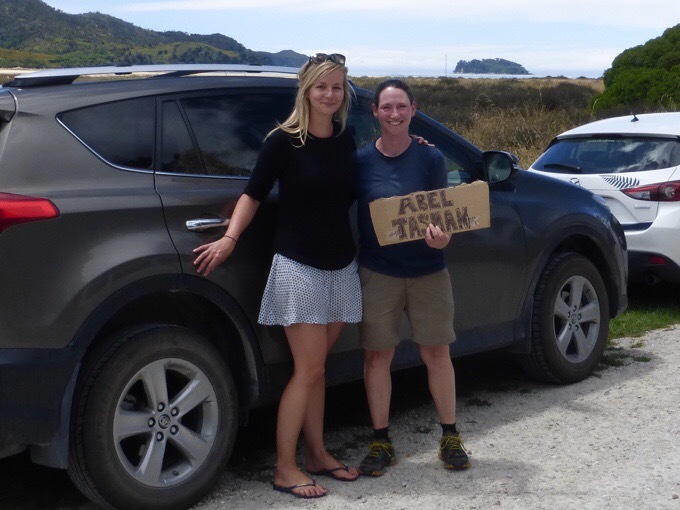 This time from Steph who is down from Auckland thinking of moving to this area and driving around. She just did the Abel Tasman recently, so that was fun. Steph wasn’t headed the whole way to the trailhead, but kindly drove me anyway and was great to talk to, THANK YOU Steph! 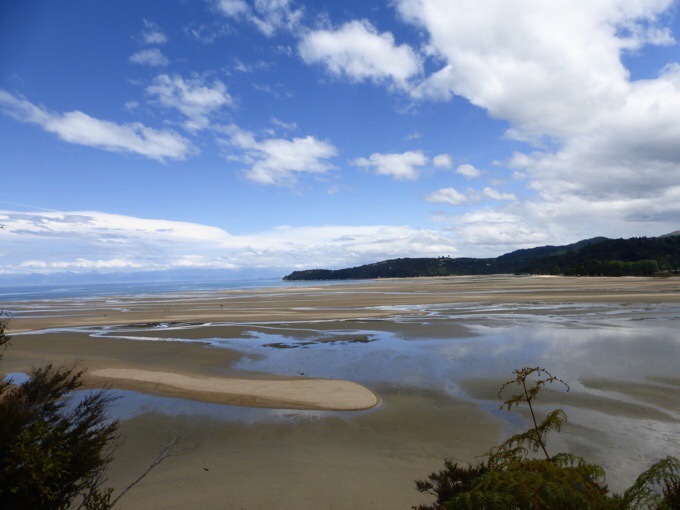 The Abel Tasman runs from the bottom to the top along the coast. I ate lunch at the trailhead and did a very leisurely walk 3mi/5km in to my campsite at Apple Tree Bay. Right off the bat, I have to say I felt immediately relaxed. The track was level, the ocean was beautiful, and weather was ideal with a light breeze. It was a big exhale for me I didn’t even realize I needed. Starting off at low tide. There are tons of people on the track, as it’s also a popular day hike location, but I found it no different than being in Yosemite, and possibly less trafficked even. What was funny is that every single one said “hi” as they walked by. I can’t even tell you how many times I said “hi” today. What was funny was I couldn’t figure out which side to stand on. Usually, I feel like it’s left out here, but it seems internationally people tend to go right. I tried to guess each time reading body language, and it was so random. Nothing felt naturally correct and I couldn’t figure that one out. I got to my campsite, Apple Tree, around 4pm. I didn’t realize it was right on the beach. 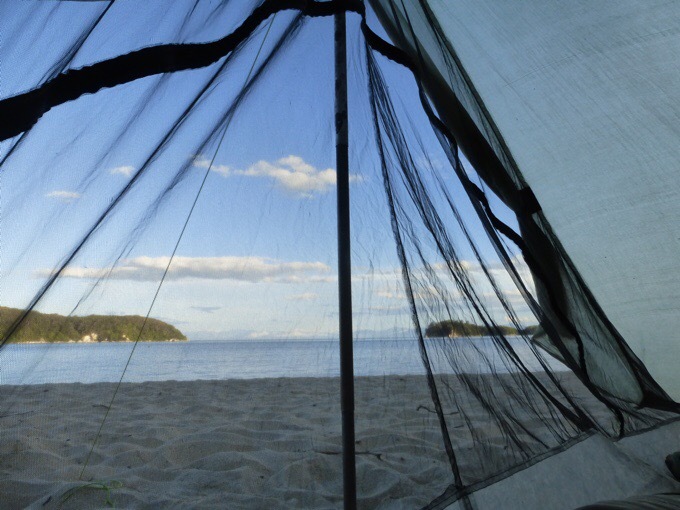 Most campsites tend to be away from views and more sheltered. Although camping in sand can be annoying, spending the rest of the day on the beach was great. 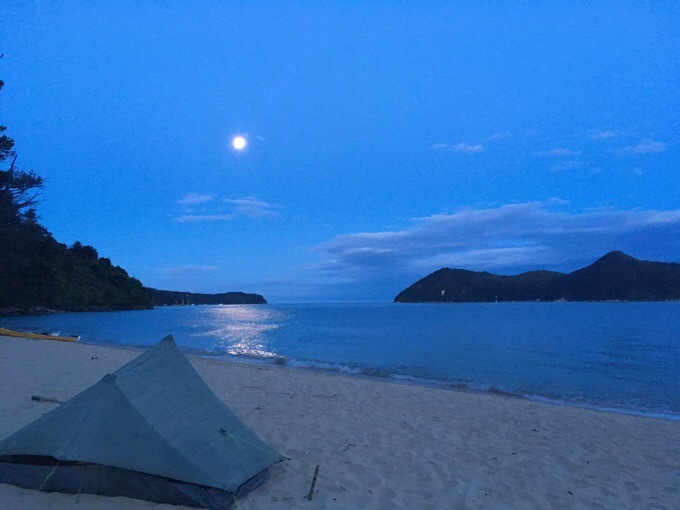 There are only about six other tents, and I walked further down the beach to be at the end and have some space. I know I keep using the word relaxing, but it was so…relaxing! It was pretty hot out while the sun was shining, and there were some sandflies (like gnats that bite), but nothing terrible. I walked on the beach along the water some and the water was an enjoyable temperature. A bit later, Grace and Gary, who gave me the hitch to Nelson, came by and visited for awhile and I was able to get a photo. THANKS for the ride Grace and Gary! Earlier today, they couldn’t decide what to do and thought they’d do an in and out day hike out here. I told them they should do that, but book one of the open spots at one of the many campsites near the trailhead. They ended up choosing not to and regretted it once out here. It’s totally worth coming out for a night if anyone gets a chance. So relaxing! The sun eventually went down behind the trees and the night was pretty darn perfect and cozy. The tide has come up and the waves are not far from my tent. The water is calm, so the waves are gently coming up every three seconds or so. My white noise combo on my white noise app has almost the exact same rhythm mixed with rain and forest sounds, so its lulling me to sleep and I think it will be a great night of rest. I’m loving the view from the tent and the stars will be great if the clouds in the distance don’t move in. As I am writing this, it’s gotten darker and what appears to be a full moon is shining amazingly over the water. It’s times like these that I wish I had a real nice camera and photography skills! The sun should rise over the ocean I think, and that could be a great way to start my big day tomorrow. I’m off to watch an episode of Mozart In The Jungle if the waves don’t put me to sleep too soon! Big exhale, ahhh. Great blog, Erin, thank you. I’m loving “walking” with you from my couch. “Is that a potato?” – I’m guessing it’s swedes (a.k.a. 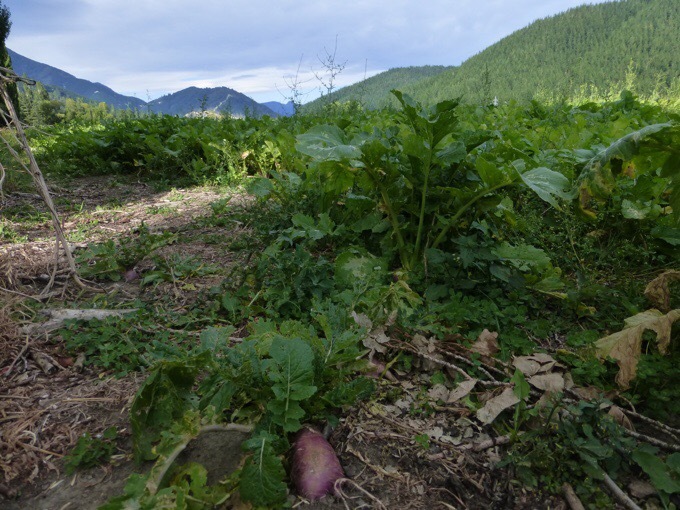 rutabagas), grown as cattle feed. Looks more like that kind of leaf than potato or kumara. I’m not able to capture moon photos either. So amazing to experience but always disappointing in my photos. What a “perfect” campsite! Did you use beefier sticks in the area for stakes for the tent due to being in loose sand? Oh, and I’m on a roll! Best photos so far. Look like a tropical paradise! We are having our fourth snow storm this winter in the Portland area. Can’t believe that your enjoying that beach and views. So jealous. 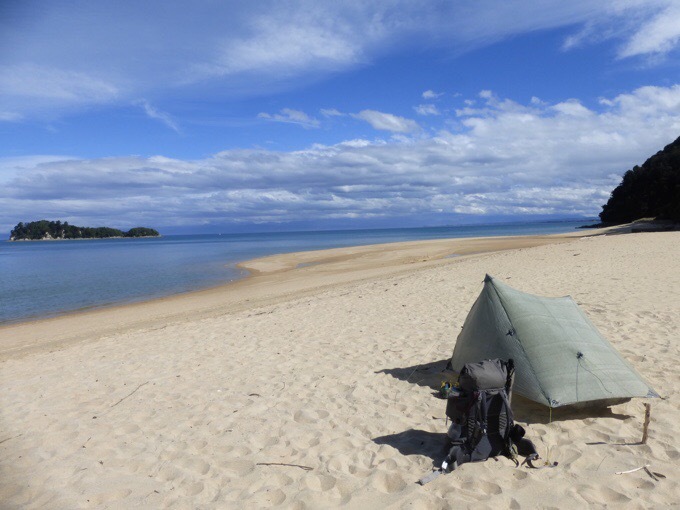 Erin your warm beach campsite is such an amazing contrast to the cold high altitude lake campsites you had on the SHR this last summer! That looks like paradise, especially compared to the night before. Seems you got really great people while hitching, too. On the soap and water vs sanitizer.. the vets at the shelter prefer soap and water and the shelter actually came out in favor, as sanitizer doesn’t touch ringworm fungus and our shelter does the gruelling amount of work it takes to get cats through ringworm and on to great adopted lives.. many places just euthanize them. So they have to be super vigilant about gloves, gowns, masks, booties… and soap and water. Maybe Becky could pick up some liquid soap on her Zero?? My wife and I did the Abel Tasman in January of 1994. 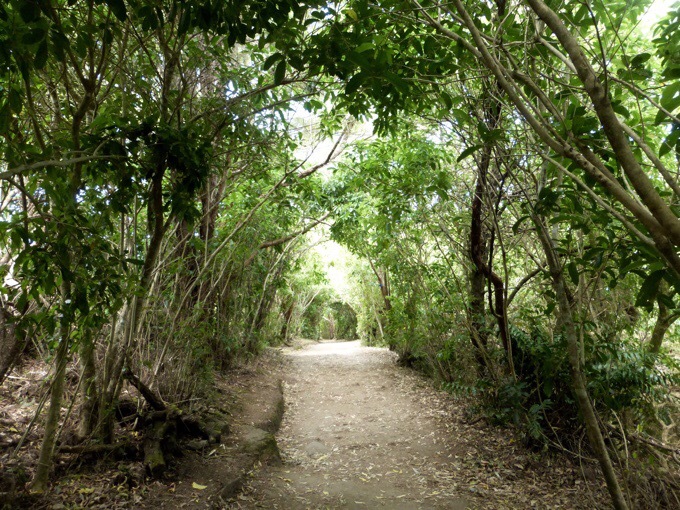 I don’t recall any other hikers but do remember the fern trees and the wonderful beach hikes. The hike was set up for us by Alan at Alan’s Place hostel in Nelson including bus tickets both ways. What a memorable place… Enjoy! 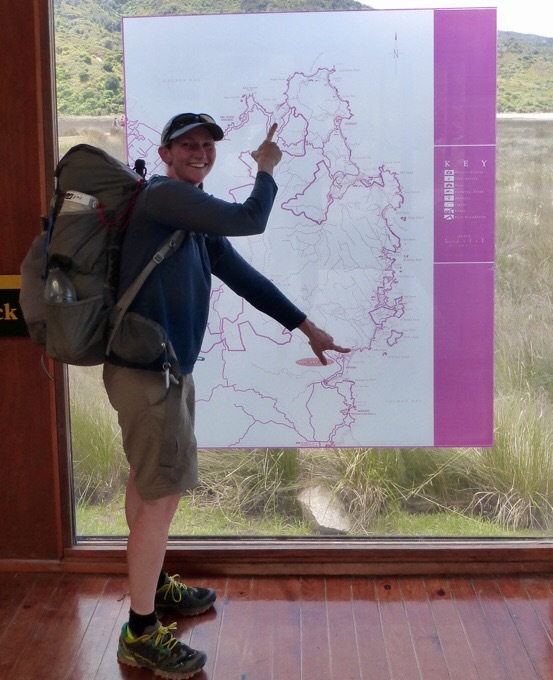 We just got back from 3 weeks of hiking on the South Island (Routeburn, Kepler and Rakiura + day trips), and I had to laugh about your observation about not knowing what side to pass on. We had the same experience when we were hiking and figured we should keep left since that is how Kiwis drive, but many of the international visitors wanted to hike on the right. We had some awkward games of chicken, but we tried to stick with it and remind everyone of the concept of “when in Rome…” with our actions. Sometimes it worked, sometimes not. Thanks for the funny reminder! We absolutely loved New Zealand and are so sad to be back in the cold winter of Chicago. Three weeks in paradise was not nearly long enough. Relish every minute you are there, Erin. We are so envious of all of your amazing adventures! “It’s times like these that I wish I had a real nice camera and photography skills!”. Don’t be too hard on yourself. Though the camera may not take the best photos, it at least to me, is more about perspective. I find that many of your photos have great perspective. So keep doing what you are doing. -Just a thought: you may ask Rockin’ about her camera and/or her suggestions. Yep, I know what she uses. There are features to mine I like more and I also don’t know how to use settings like she does and I’m too lazy to, ha! When this one finally breaks or I lose it, I may look into something like hers. 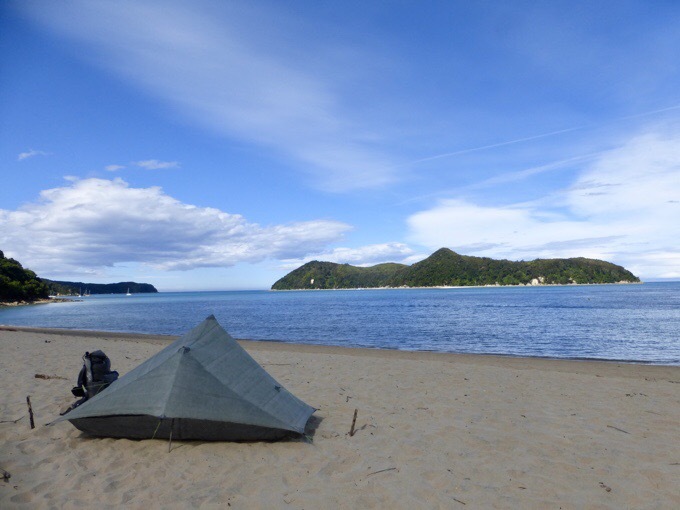 One day Abel Tasman! Wow. It took my group about 2 3/4 days and we stayed inside. You are amazing. Loved the photos. Haha, it was because of permits. I would have liked to get another day in there. Yes, that is true re hand sanitizer & noro, unfortunately. Hand sanitizer can be used in conjunction with soap & water, but isn’t a substitute for it (according to the CDC).